Can mmWave sensors prevent damage to your car door? Have you ever opened your car door, only to hit the door of the car next to you, or a pole you didn’t see? Or have you ever opened the trunk of your car automatically to see it collide with the roof of the garage? In both cases, your car door suffered damage, and you wished you could have avoided it – and the expensive repair. To share a personal experience, I drove to a shopping mall recently in my luxury sports car. After I parked in the garage, I opened the car door and hit a small metal pipe extension that I could not see, even though I was very careful. Car manufacturers have considered several sensing solutions in the past to solve this problem, but many sensors cannot reliably detect objects under multiple environmental conditions or in multiple locations around car doors. For instance, some sensors only detect objects in a single direction, while radar sensors can “see” a wide 3D space around them. Millimeter-wave (mmWave) sensors are small enough to be hidden inside car doors, so there is no need to alter the design of the vehicle. mmWave sensors also continue to function despite noise interference from other sources, like ultrasonic sensors, in the sonic frequency range. mmWave sensors remove the limitations of using cameras, which have difficulty detecting objects in the dark or when snow, dirt or mud are present, which can obscure the lens. Because no lenses are needed, TI’s AWR mmWave sensors can sense obstacles in the vicinity of car doors or trunks in a variety of environmental conditions like snow, rain and bright sunlight. 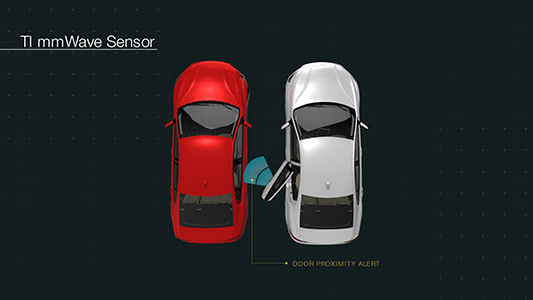 mmWave sensors can not only be used for smart door opening, but can also be used as side-impact radars when a car is in motion to detect objects like other cars, static obstructions or pedestrians. For example, TI’s AWR1642 sensor has a multimodal, programmable digital signal processor (DSP) that allows you to configure the sensor to detect objects in a 3D space up to 1 or 2m around a car door or trunk when parked for smart door opening, or to configure the sensor to operate when the car is in motion for side impact detection. A few other applications of this sensor include the detection of curb and curb height, parking assistance, and even the recognition of speed bumps and potholes in the road if you place the sensor in the front of the vehicle rather than in the door. 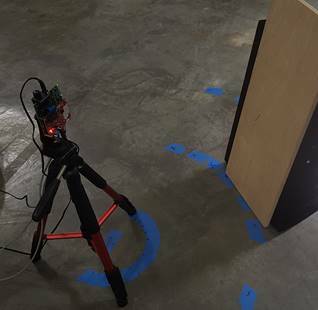 We tested the AWR1642 mmWave sensor to detect objects like a plastic pipe, wooden plank, metal objects and traffic cones at different distances and fields of view. Figure 3 shows the test setup, with the obstacle detection sensor mounted on a tripod at a height of 0.5m from the ground’s surface. We placed objects at 0.5m and 1m distances and in different angular positions and observed the detections. In most cases, we could detect the obstacle with accuracy up to ±70 degrees. Figure 4 shows the experimental setup for the detection of curb height where a 19 cm height curb-stone is placed 30cm away from the sensor. 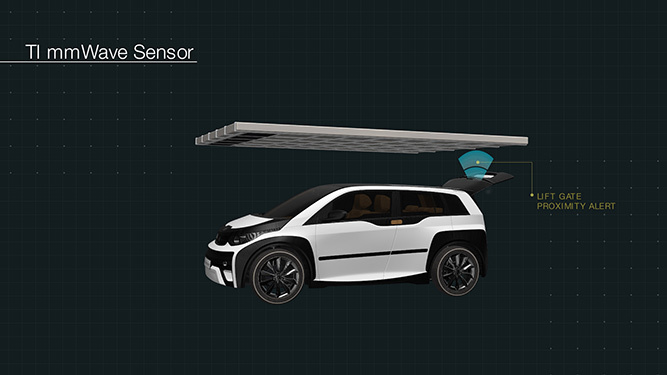 The sensor is placed 90cm above the ground, which corresponds to the door handle height of a typical car. 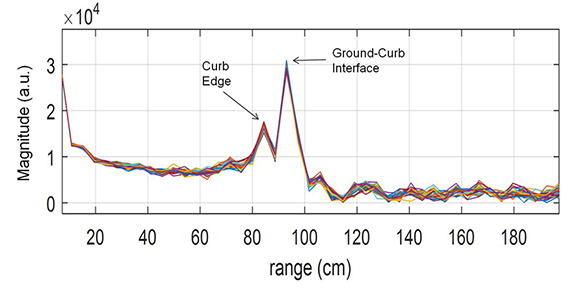 Figure 5 shows the range profile measured from the sensor which shows one reflection coming from the edge of the curb while another reflection coming from the corner formed by the ground-curb interface. The height of the curb can also be estimated by measuring the angle corresponding to these reflections. The height estimated in this case was ~20.5 cm which is close to the actual curb height of 19 cm. This information could be used in the design of automatic door alerts, which can notify drivers or passengers about a possible obstruction outside the vehicle when a door is opened. 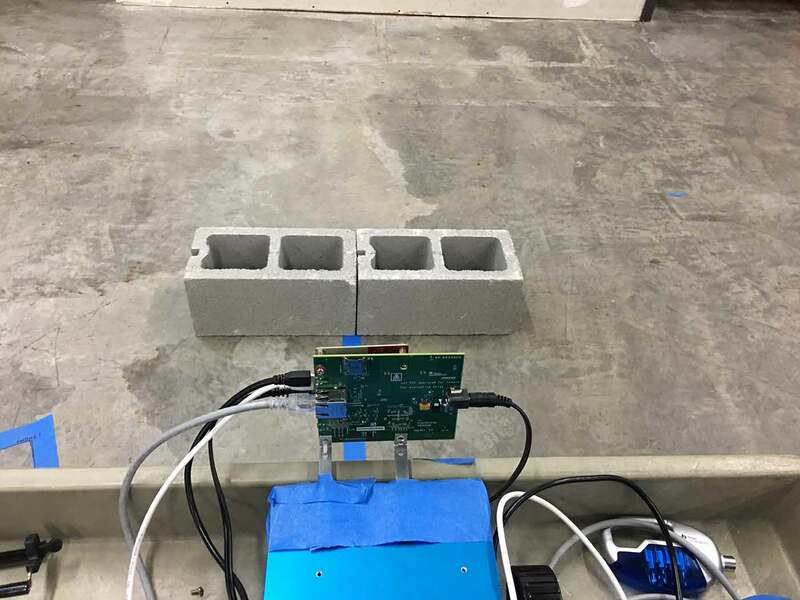 .Figure 4: An obstacle detection sensor evaluation module in front of a 19cm-high curb stone, with the sensor at a distance of 30cm. Figure 5: The detection points from the curb, with the curb edge and ground curb interface visible in the processed data. The obstacle detection sensor evaluation module (EVM) shown in Figure 6 uses the AWR1642 sensor. It has a single-patch antenna, which enables it to see in a wide field of view at a close range. In addition, the sensor can detect in both azimuth and elevation directions, which enables obstacle detection in a 3D space. These tests show that the AWR1642 sensor can enable obstacle detection sensing when placed in car doors, trunks and around the vehicle. mmWave sensors can enable precise recognition and avoidance of obstacles in parking areas and on roads. Start your automotive obstacle detection design by evaluating the mmWave AWR1642 sensor today. Learn about body chassis sensing through mmWave sensors in the white paper, “77GHz single chip radar sensor enables automotive body and chassis applications”. Watch a free space sensor demonstration video using TI’s automotive mmWave sensor. View the reference software and download the obstacle detection reference design. Hi Kishore, Can you share the Data and full results of the Obstacle Detection noted in this blog?